PRESS RELEASE: Developed to combine the rich, warm tone of vintage cymbals with the more aggressive performance characteristics required by modern players, TRX "Icons" are a versatile, musical yet progressive new series of cymbals from the TRX Cymbal Co.
TRX Icons offer a full spectrum of sounds within a single series and are recommended for contemporary Rock, R&B and Latin drumming as well as other relevant styles and situations. Icon cymbals are handcrafted in Turkey by master cymbalsmiths, featuring traditional lathing with a highly-polished, brilliant finish to create an eye-catching appearance and an ear-catching tonal range with a balance of body and projection. The cymbals are available in a wide selection of sizes and styles, including the bigger sizes and heavier weights that are preferred by many of today's players. In addition, Icon crash cymbals come in Thin, Medium and Heavy models—giving drummers an extended range of crash and crash-ride options. The Icon Series consists of: 20-23˝ Rides; 13-15˝ Hi-Hats; 14-20˝ Thin Crashes; 16-21˝ Medium Crashes; 18-23˝ Heavy Crashes; 12-21˝ Chinas; and 8-12˝ Splashes. 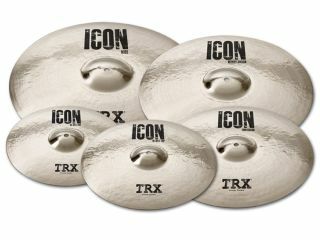 TRX Icons also include 14, 16, 18 and 20˝ Stackers, which are medium-thin, vented cymbals that can be used individually for crash effects or placed directly under or on top of other Icons to create the short, trashy sound that is increasingly popular in modern drumming. Created in conjunction with top TRX artists Jamal Moore (Diddy/Kelly Rowland/Keri Hilson), Travis Orbin (Sky Eats Airplane) and Mike Fuentes (Pierce The Veil), TRX Icons are a fresh, new standard of sound, looks and performance designed to serve the diverse, demanding needs of a new generation of drummers.